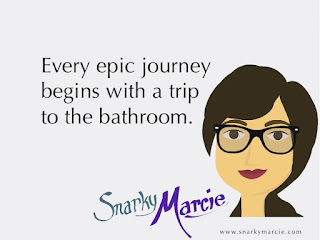 Snarky Marcie: It's Friday, you made it! ...as if there is such a thing. It may have taken a few clean venting sessions. It may have taken a lot of balance between distractions and focus. It may have taken away a bit of your sanity, but you're here. 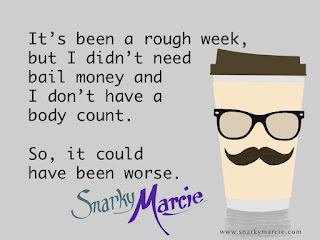 You made it to the end of the week, congrats! Even if you have to work the weekend, there is a different air around the days. It's designed for rest, recharging, and recreation. Two and a half days, if you count Friday evening as you should, to enjoy. I challenge you this weekend to get out of your routine. Shake it up! 5. If you normally stay in, get out. You're the reserved type. Why see people when people are what cause wars. Okay, a little extreme. I get it, you are set to finish your book this weekend. Or, you're going to catch up on every show of Gilmore Girls before Netflix releases the final four episodes. These are great things, I completely agree. 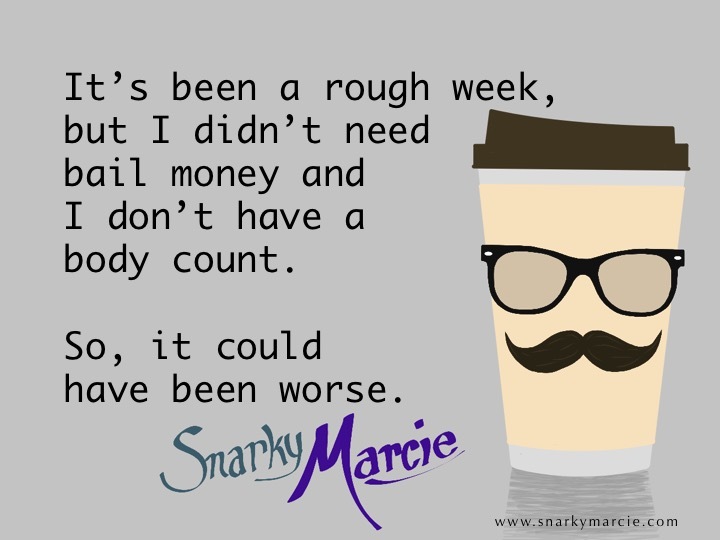 But, make this weekend about shaking things up. Get out of the house! Go to the farmer's market, go to the library, go hangout at the coffee shop. Try your hardest to actually speak with people. Don't be a creep and stare at them from the top edge of your book. Find out what is happening in downtown, and go experience it. Experience something new that gets you out of your normal comfort zone. #Grow! 4. If you normally get out, stay in. If you're a man about town, or someone who gets antsy staying at home all weekend, you just need to be around your friends 24/7, stay inside for a change. Read the book you keep on your mantle to make yourself feel accomplished. Unpack those boxes in the spare room from when you moved in 6 years ago. Watch a documentary, watch a Ted Talk, take a little time to expand your thinking. I know, you have a great Fear-Of-Missing-Out. Guess what. You can wait until Monday evening to hear about Noelle's new outfit, don't worry...she won't let you live for long without knowing of its greatness. This next week, you may be the last to know about the new relationship that popped up. They even accidentally spilled the beans to the guy in the corner, you're literally the last to know! I'm sure your friend is worse off for not having your golden opinion on her life, but she will still live and probably have a better relationship for it. 3. If you normally clean, be crafty. You could be both, I suppose. But, I've really seen to extremes in this area. You have the wannabe crafty lady who is too organized and OCD to ever get the supplies out of their well-contained space. There is a place for everything and everything has a place. While you like the idea of being craft, it would also mean making a mess. I believe that anyone can be creative. Art is subjective which is a pretty word for 'no one is wrong'. It is all in the eye of the beholder. I may not understand your creepy painting of a doll (oh, that's your daughter? ), but I don't have to get it. Be proud, be fearless. Create something! 2. If you're normally crafty, get cleaning. On the other side, you could be too crafty. It's gotten to the point where in the search for the hot glue, you've found two unfinished necklaces, some lace you were going to use as a stencil, three copies of DIY magazine now cut to pieces and ready for some collage, whenever the opportunity strikes...as long as you can still find it. Your craft table has become a war zone, and it is starting battle with the living room. I'm sure that Pinterest piece you had in mind for this weekend is wonderful, but let it wait this time. Instead, take some time and organize your space. You can define family many different ways. Blood related, emotionally connected, stuck together under one roof, many groups can be your family. Hopefully time with them is how you recharge. If not, it's probably because the adults are outnumbered by toddlers and barbies, and you're doing all you can to keep it together. If that is you, find the fun. Perhaps you let them make a mess this weekend, and you even join in. Be a kid again. In the end, you'll be exhausted, but it will be fun. #FunFamily. Thank you for reading! Or, at least thank you for clicking the link and then realizing you're in the wrong place, it still counts in my book. The list of email subscribers is growing and my page views are better than I could have imagined. Perhaps, my mom and sister keep hitting refresh all day, but it still makes me feel pretty #blessed.